Keep all the game comments here. In addition to Sellers, also inactive for the Redskins are wide receivers Donte Stallworth and Leonard Hankerson, strong safety LaRon Landry, linebacker Markus White and offensive lineman Willie Smith. Sellers and Stallworth among The inactive. Interesting. It'll be nice to see the season start again. Does anyone have a good site where I can stream the game? I am impossibly excited for this game. Nice to see a packed house there on time for the 9/11 tribute. Rare to see folks there on time. The most hopeful, optimistic and exciting part of the season, minutes before kickoff of the first game of the season!! 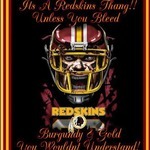 Please embarrass the Giants, Skins!! Can't find an audio feed online. Help! 3 and out as usual. Got lucky with that drop...Giants winning the LoS battle early. Ugh. We can't get a first down?? 3 and out once again. I see we've picked up right from where we left off last year.